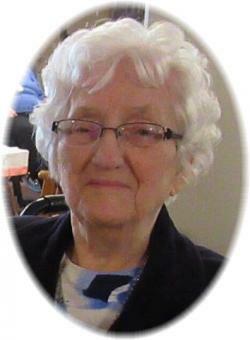 Anita Eugenie Potter – 97, of Grand View Manor, Berwick, formerly of Foster Street, Berwick, passed away peacefully on Sunday, December 2, 2018 in the Valley Regional Hospital, Kentville. Born in South Waterville, Kings County, she was a daughter of the late James Percy and Ella Eugenie (Crocker) Foster. Anita had been a loving wife, mother and grandmother. She was a people person and had a strong love of life. With her sharp mind and quick wit could often be heard singing a song or quoting a verse. Anita was a member of the Berwick United Church. She is survived by one daughter, Deanna (James) Fredericks, Berwick; one sister, Maizie Bligh, Berwick; five grandchildren, Shelley Potter (John Karapita), Toronto; Heather (Chris) Thomson, Kentville; Greydon (Karrie) Potter, Toronto; Lyndsay (Mike) Reynolds, Kingston; Tyler Fredericks, Berwick; seven great grandchildren; nieces and nephews. She was predeceased by her husband, George; one son, Donald; four sisters, Betty Lloyd, Joyce Durno, Shirley Smith, Erdenna Sanford; a brother, George Foster. Cremation has taken place. There will be no visitation, by request. The funeral service will be held at 2:00 p.m., Friday, December 7, 2018 in the Berwick United Church, Reverend Tom Woods officiating. Private interment will take place in the Berwick Cemetery. Following the interment a reception will be held in the Berwick United Church Hall. Donations in memory may be made to the Heart and Stroke Foundation of Nova Scotia or the Berwick United Church. Funeral arrangements have been entrusted to the White Family Funeral Home and Cremation Services, Kentville.